About Us At Custom Modern Bathroom & Kitchen, we recognize that our clients have many different kitchen and bath remodeling options to choose from, and that they may be wondering what sets us apart from our competitors. We are here to provide a comprehensive home remodeling experience, providing as much or as little collaboration as you like. Over our ten years in business, we have expanded our scope of services to include every phase of the remodeling and building process. 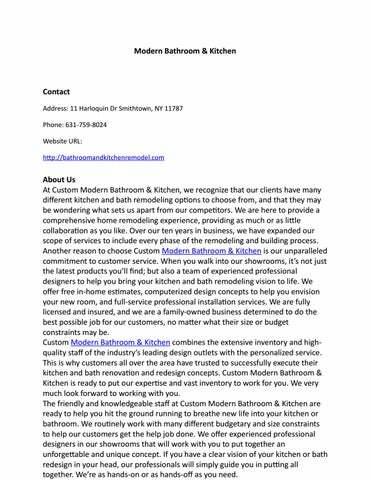 Another reason to choose Custom Modern Bathroom & Kitchen is our unparalleled commitment to customer service. When you walk into our showrooms, it’s not just the latest products you’ll find; but also a team of experienced professional designers to help you bring your kitchen and bath remodeling vision to life. We offer free in-home estimates, computerized design concepts to help you envision your new room, and full-service professional installation services. We are fully licensed and insured, and we are a family-owned business determined to do the best possible job for our customers, no matter what their size or budget constraints may be. Custom Modern Bathroom & Kitchen combines the extensive inventory and highquality staff of the industry’s leading design outlets with the personalized service. This is why customers all over the area have trusted to successfully execute their kitchen and bath renovation and redesign concepts. Custom Modern Bathroom & Kitchen is ready to put our expertise and vast inventory to work for you. We very much look forward to working with you. 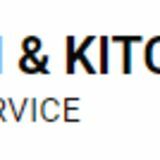 The friendly and knowledgeable staff at Custom Modern Bathroom & Kitchen are ready to help you hit the ground running to breathe new life into your kitchen or bathroom. We routinely work with many different budgetary and size constraints to help our customers get the help job done. We offer experienced professional designers in our showrooms that will work with you to put together an unforgettable and unique concept. If you have a clear vision of your kitchen or bath redesign in your head, our professionals will simply guide you in putting all together. We’re as hands-on or as hands-off as you need.